I work with several interior design professionals in the Miami area. Among my clients is Avant Design Group. Avant Design Group (a Miami based interior design firm) hired me to photograph their interior design showcase during Casa Decor in Miami, FL. For this event, Cristina Souza from Avant Design Group designed a residential space showcase. Their showcase was such a huge success that their booth was featured on the Sun Post and Florida International Design Magazine. Our images were used in an article that appeared in Florida International Magazine. Since then Avant Design group has taken off as an interior design firm and I've had the pleasure of photographing all of their interior design successes. Show houses are to designers what opening nights are to performers. It's a chance to show the public what they're made of - a portfolio come to life if you will. At a recent such endeavor, Cristina Souza of Avant Design in Miami proved that cool and contemporary is how she articulates best. 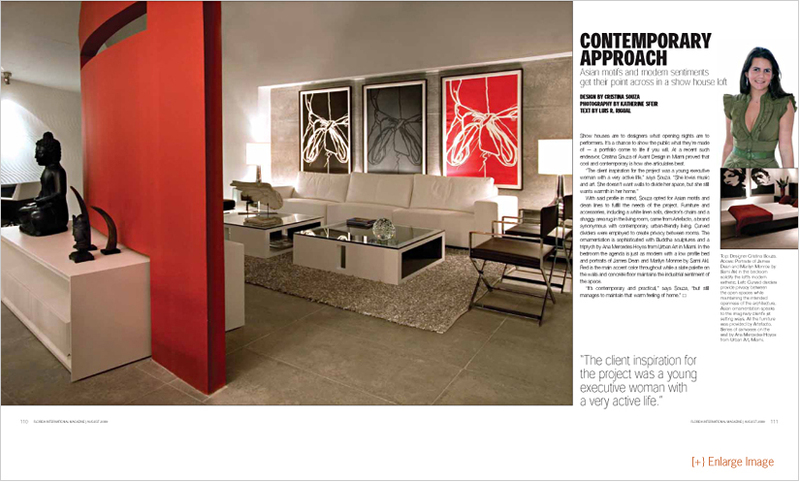 "The client inspiration for the project was a young executive woman with a very active life," says Souza. "She loves music and art. She doesn't want walls to divide her space, but she still wants warmth in her home." Architectural Photography by Kate Sfeir | email. photography@katesfeir.com or call 954-895-6753. Providing professional photography services in Miami/Fort Lauderdale, FL and in Camden/Rockport, ME or to your specific location.